The Bhagavad Gita is widely revered as one of the greatest jewels of spiritual wisdom in the history of humankind. It is also known as Gitopanishad, or the Gita Upanishad, as it encapsulates most of the important aspects of the knowledge of the Vedas. The Bhagavad Gita is widely revered as one of the greatest jewels of spiritual wisdom in the history of humankind. It is also known as Gitopanishad, or the Gita Upanishad, as it encapsulates most of the important aspects of the knowledge of the Vedas. Bhagavad means “of God” and Gita means “song.” Hence, the Bhagavad Gita literally means “Song of God.” It describes the divine dialogue that took place between the Supreme Lord Shree Krishna and his devotee Arjun on the battle ground. Since its teachings are exceedingly profound, the Bhagavad Gita required an equally insurmountable crisis as its setting. This was the impending war of Mahabharat that threatened to engulf the whole of India at that time. Unable to deal with the immediate problem at hand, Arjun approached Shree Krishna for a palliative to overcome the anguish he was experiencing. Shree Krishna did not just advise him on his immediate problem, but digressed to give a profound discourse on the philosophy of life. Hence, the Bhagavad Gita imparts, above everything else, Brahma Vidya, the science of God-realization. However, it is not content with providing a lofty philosophical understanding; it describes clear-cut techniques for implementing its spiritual precepts for everyday life. These techniques of applying the science of spirituality in our lives are termed “Yog.” The Bhagavad Gita is also called “Yog Shastra,” meaning, the scripture that teaches the practice of Yog. Thus, all its eighteen chapters are designated as different types of Yog because they deal with methodologies for the application of spiritual knowledge to practical life. 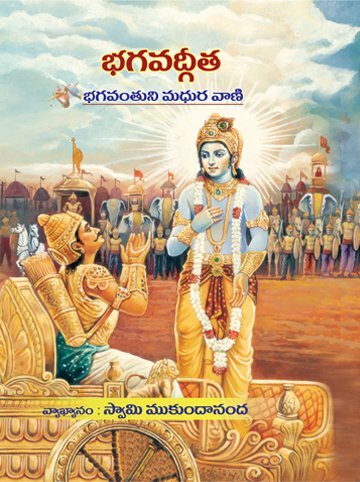 In this authoritative commentary, Swami Mukundananda reveals the original meanings of the verses with crystal clear explanations and perfect logic. Adopting a comprehensive approach, he intersperses his purports with illustrative stories and real-life examples to make the teachings easy to comprehend and implement in everyday living.